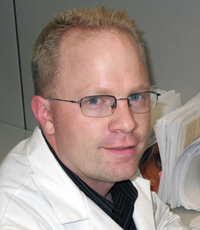 Matt is a licensed and certified genetic counselor with over 6 years of clinical experience. Born and raised in Spokane, he obtained his Bachelors in Genetics from Washington State University. His graduate work took him away from the Pacific Northwest, and he earned his Masters in Genetic Counseling from the University of Texas Health Science Center in Houston. Prior to becoming a genetic counselor, Matt performed research at the College of Veterinary Medicine at Washington State University, and has co-authored several scientific journal articles. He is an active member of the National Society of Genetic Counselors and has served on many volunteer committees within the organization. He enjoys lecturing at local schools on the career of genetic counseling; and regularly serves as a guest lecturer at the College of Nursing at WSU Spokane. He is a consultant to genetic testing companies and is supportive of the vision of Paw Print Genetics. You can follow him on Twitter at @Matt_Tschirgi, where he tweets about all things genetic.